Just looking at the previews, My Annoying Brother appears to be fairly standard but fun bawdy comedy fare with a smattering of heartwarming family values. However, while the movie has its lighthearted sections and its fair share of crude humor, the rest is much darker and more serious than originally expected, leaving the viewer torn between laughing and crying. 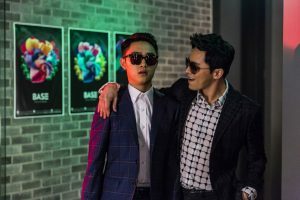 “My Annoying Brother” is the story of a criminal, played by Jo Jung-suk, who gets out of prison on early parole so that he can supposedly care for his younger step-sibling, played by EXO’s main vocal D.O., who was recently blinded in a judo accident. Though the two have polar opposite temperaments, with Doo-young being a quiet and disciplined athlete and Doo-shik being a foul-mouthed con man, they must learn to peacefully co-exist in the same household. After a rocky start, the siblings begin to rekindle their once strong bond and work together to train Doo-young for the Special Olympics. As the elder becomes more responsible and the younger becomes more free-spirited, the brothers learn that they bring out the best in each other. All this could be ascertained from the trailers or perhaps even from the predictable nature of the plot line, but the unexpected twist comes when Doo-shik is diagnosed with an incurable illness that leaves him little time to live. In a matter of mere minutes, the film goes from buddy comedy to tear-jerker. Though the film was overall very enjoyable, if there had to be one issue, it would be the aforementioned shift in tone. As stated previously, everything about the promotions pointed to this film being a comedy. The first half of the film fits with this genre, though nothing is quite guffaw-worthy and one of the major jokes unfortunately revolves around repeatedly ridiculing a woman perceived to be hideous. After the realization of Doo-shik’s tragic reality, though, the change in tone is so sudden that it feels almost like being pulled out of one movie and thrust into another. What makes it more confusing still is that nothing in the film previously indicates concerns about his health other than a couple of minor stomach complaints. This is not to say that either part of the movie was bad in and of itself, but putting the two together without much transition makes for a slightly odd and emotionally confusing viewing experience. The most interesting thing about the film, though, was how the structure resembled that of a stage play, specifically a two-hander (a play involving only two characters). The two main leads delivered extensive dialogues in long scenes with only minimal physicality to fall back on. True, Park Shin-hye and Kim Gang-hyun played their roles well with the little material they were given, the impact of their characters was so minimal that their absence honestly would not have been felt. While this theatrical format allowed the actors to explore their emotions in depth, it did at times slow down the pace of the film. Luckily, the incredible acting in this movie compensates for any tone and pacing issues. Jo Jung-suk is already well known in the entertainment industry for his variety of talents as well as his acting range, which was on full display with this role. One second he can be seen cracking jokes involving multiple swear words and the next he is having a tearful breakdown in the hospital lobby. D.O. is more of a rookie in the film and television industry, but if anyone has yet to see his previous work or still somehow doubts his talents, this film would be enough to put those doubts to rest. Take one of the final scenes, where Doo-young wins the gold medal in the Special Olympics only moments after finding out the horrible truth of his brother’s imminent passing and proceeds to repeatedly scream out “brother” in the most heart-wrenching manner as tears stream down his face. In fact, both actors should be applauded on their ability to produce truly believable and utterly devastating tears (and snot) on the spot. Both actors continue to show different sides of themselves with every new performance they give and seeing this growth unfold on the screen is very satisfying for the viewers. Though My Annoying Brother throws viewers for a loop, it is far from disappointing and worth seeing for the performances alone. Perhaps going in with preconceived notions about the film hinders the viewing experience, so watching with an open mind might make all the difference. The Sunday Social, 12/11: Big Bang Comeback Party Post!